IDF provides useful feature for program behavior analysis: application level tracing. It is implemented in the corresponding library and can be enabled in menuconfig. This feature allows to transfer arbitrary data between host and ESP32 via JTAG interface with small overhead on program execution. Tracing components when working over JTAG interface are shown in the figure below. Post-mortem mode. This is the default mode. The mode does not need interaction with the host side. In this mode tracing module does not check whether host has read all the data from HW UP BUFFER buffer and overwrites old data with the new ones. This mode is useful when only the latest trace data are interesting to the user, e.g. for analyzing program’s behavior just before the crash. Host can read the data later on upon user request, e.g. via special OpenOCD command in case of working via JTAG interface. Streaming mode. Tracing module enters this mode when host connects to ESP32. In this mode before writing new data to HW UP BUFFER tracing module checks that there is enough space in it and if necessary waits for the host to read data and free enough memory. Maximum waiting time is controlled via timeout values passed by users to corresponding API routines. So when application tries to write data to trace buffer using finite value of the maximum waiting time it is possible situation that this data will be dropped. Especially this is true for tracing from time critical code (ISRs, OS scheduler code etc.) when infinite timeouts can lead to system malfunction. In order to avoid loss of such critical data developers can enable additional data buffering via menuconfig option CONFIG_ESP32_APPTRACE_PENDING_DATA_SIZE_MAX. This macro specifies the size of data which can be buffered in above conditions. The option can also help to overcome situation when data transfer to the host is temporarily slowed down, e.g due to USB bus congestions etc. But it will not help when average bitrate of trace data stream exceeds HW interface capabilities. Host side: Application tracing is done over JTAG, so it needs OpenOCD to be set up and running on host machine. For instructions on how to set it up, please see JTAG Debugging for details. Target side: Application tracing functionality can be enabled in menuconfig. Component config > Application Level Tracing menu allows selecting destination for the trace data (HW interface for transport). Choosing any of the destinations automatically enables CONFIG_ESP32_APPTRACE_ENABLE option. 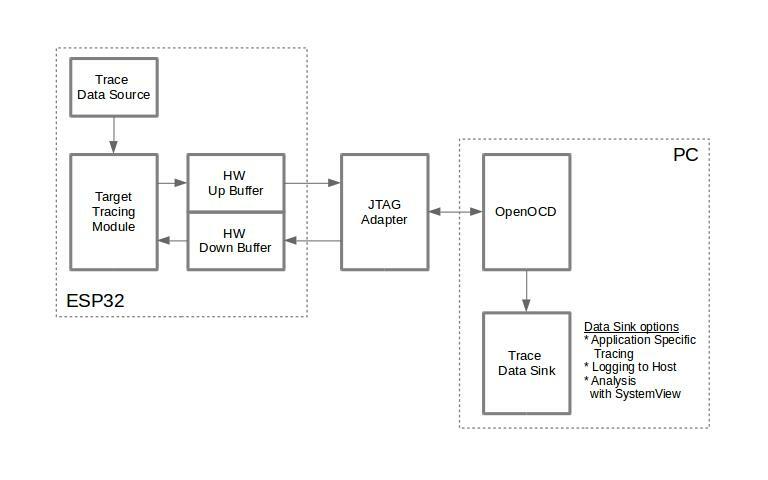 In order to achieve higher data rates and minimize number of dropped packets it is recommended to optimize setting of JTAG clock frequency, so it is at maximum and still provides stable operation of JTAG, see Optimize JTAG speed. Threshold for flushing last trace data to host on panic (CONFIG_ESP32_APPTRACE_POSTMORTEM_FLUSH_TRAX_THRESH). This option is necessary due to the nature of working over JTAG. In that mode trace data are exposed to the host in 16 KB blocks. In post-mortem mode when one block is filled it is exposed to the host and the previous one becomes unavailable. In other words trace data are overwritten in 16 KB granularity. On panic the latest data from the current input block are exposed to host and host can read them for post-analysis. System panic may occur when very small amount of data are not exposed to the host yet. In this case the previous 16 KB of collected data will be lost and host will see the latest, but very small piece of the trace. It can be insufficient to diagnose the problem. This menuconfig option allows avoiding such situations. It controls the threshold for flushing data in case of panic. For example user can decide that it needs not less then 512 bytes of the recent trace data, so if there is less then 512 bytes of pending data at the moment of panic they will not be flushed and will not overwrite previous 16 KB. The option is only meaningful in post-mortem mode and when working over JTAG. Timeout for flushing last trace data to host on panic (CONFIG_ESP32_APPTRACE_ONPANIC_HOST_FLUSH_TMO). The option is only meaningful in streaming mode and controls the maximum time tracing module will wait for the host to read the last data in case of panic. This library provides API for transferring arbitrary data between host and ESP32. When enabled in menuconfig target application tracing module is initialized automatically at the system startup, so all what the user needs to do is to call corresponding API to send, receive or flush the data. On target side user should implement algorithms for writing trace data to the host. Piece of code below shows an example how to do this. esp_apptrace_write() function uses memcpy to copy user data to the internal buffer. In some cases it can be more optimal to use esp_apptrace_buffer_get() and esp_apptrace_buffer_put() functions. They allow developers to allocate buffer and fill it themselves. The following piece of code shows how to do this. Also according to his needs user may want to receive data from the host. Piece of code below shows an example how to do this. esp_apptrace_read() function uses memcpy to copy host data to user buffer. In some cases it can be more optimal to use esp_apptrace_down_buffer_get() and esp_apptrace_down_buffer_put() functions. They allow developers to occupy chunk of read buffer and process it in-place. The following piece of code shows how to do this. The next step is to build the program image and download it to the target as described in Build and Flash. Run OpenOCD (see JTAG Debugging). Connect to OpenOCD telnet server. It can be done using the following command in terminal telnet <oocd_host> 4444. If telnet session is opened on the same machine which runs OpenOCD you can use localhost as <oocd_host> in the command above. Start trace data collection using special OpenOCD command. This command will transfer tracing data and redirect them to specified file or socket (currently only files are supported as trace data destination). For description of the corresponding commands see OpenOCD Application Level Tracing Commands. The final step is to process received data. Since format of data is defined by user the processing stage is out of the scope of this document. Good starting points for data processor are python scripts in $IDF_PATH/tools/esp_app_trace: apptrace_proc.py (used for feature tests) and logtrace_proc.py (see more details in section Logging to Host). HW UP BUFFER is shared between user data blocks and filling of the allocated memory is performed on behalf of the API caller (in task or ISR context). In multithreading environment it can happen that task/ISR which fills the buffer is preempted by another high priority task/ISR. So it is possible situation that user data preparation process is not completed at the moment when that chunk is read by the host. To handle such conditions tracing module prepends all user data chunks with header which contains allocated user buffer size (2 bytes) and length of actually written data (2 bytes). So total length of the header is 4 bytes. OpenOCD command which reads trace data reports error when it reads incomplete user data chunk, but in any case it puts contents of the whole user chunk (including unfilled area) to output file. Below is the description of available OpenOCD application tracing commands. Currently OpenOCD does not provide commands to send arbitrary user data to the target. Dump all data from (post-mortem dump). Path to file to save data from both CPUs. This argument should have the following format: file://path/to/file. Data polling period (in ms) for available trace data. If greater than 0 then command runs in non-blocking mode. By default 1 ms. Maximum size of data to collect (in bytes). Tracing is stopped after specified amount of data is received. By default -1 (trace size stop trigger is disabled). Idle timeout (in sec). Tracing is stopped if there is no data for specified period of time. By default -1 (disable this stop trigger). Optionally set it to value longer than longest pause between tracing commands from target. If 0 start tracing immediately, otherwise command waits for the target to be halted (after reset, by breakpoint etc.) and then automatically resumes it and starts tracing. By default 0. Number of bytes to skip at the start. By default 0. If poll_period is 0, OpenOCD telnet command line will not be available until tracing is stopped. You must stop it manually by resetting the board or pressing Ctrl+C in OpenOCD window (not one with the telnet session). Another option is to set trace_size and wait until this size of data is collected. At this point tracing stops automatically. Collect 2048 bytes of tracing data to a file “trace.log”. The file will be saved in “openocd-esp32” directory. The tracing data will be retrieved and saved in non-blocking mode. This process will stop automatically after 2048 bytes are collected, or if no data are available for more than 5 seconds. Tracing data is buffered before it is made available to OpenOCD. If you see “Data timeout!” message, then the target is likely sending not enough data to empty the buffer to OpenOCD before expiration of timeout. Either increase the timeout or use a function esp_apptrace_flush() to flush the data on specific intervals. Retrieve tracing data indefinitely in non-blocking mode. There is no limitation on the size of collected data and there is no any data timeout set. This process may be stopped by issuing esp32 apptrace stop command on OpenOCD telnet prompt, or by pressing Ctrl+C in OpenOCD window. Retrieve tracing data and save them indefinitely. OpenOCD telnet command line prompt will not be available until tracing is stopped. To stop tracing press Ctrl+C in OpenOCD window. To configure tracing immediately after reset use the openocd reset halt command. IDF implements useful feature: logging to host via application level tracing library. This is a kind of semihosting when all ESP_LOGx calls send strings to be printed to the host instead of UART. This can be useful because “printing to host” eliminates some steps performed when logging to UART. The most part of work is done on the host. Format string is parsed to obtain type of each argument. According to its type every argument is converted to string representation. Format string combined with converted arguments is sent to UART. Though implementation of vprintf-like function can be optimized to a certain level, all steps above have to be performed in any case and every step takes some time (especially item 3). So it frequently occurs that with additional log added to the program to identify the problem, the program behavior is changed and the problem cannot be reproduced or in the worst cases the program cannot work normally at all and ends up with an error or even hangs. Possible ways to overcome this problem are to use higher UART bitrates (or another faster interface) and/or move string formatting procedure to the host. Application level tracing feature can be used to transfer log information to host using esp_apptrace_vprintf function. This function does not perform full parsing of the format string and arguments, instead it just calculates number of arguments passed and sends them along with the format string address to the host. On the host log data are processed and printed out by a special Python script. Tracing from ESP_EARLY_LOGx macros is not supported. No support for printf arguments which size exceeds 4 bytes (e.g. double and uint64_t). Only strings from .rodata section are supported as format strings and arguments. Maximum number of printf arguments is 256. On target side special vprintf-like function needs to be installed. As it was mentioned earlier this function is esp_apptrace_vprintf. It sends log data to the host. Example code is provided in system/app_trace_to_host. Follow instructions in items 2-5 in Application Specific Tracing. To print out collected log records, run the following command in terminal: $IDF_PATH/tools/esp_app_trace/logtrace_proc.py /path/to/trace/file /path/to/program/elf/file. Another useful IDF feature built on top of application tracing library is the system level tracing which produces traces compatible with SEGGER SystemView tool (see SystemView). SEGGER SystemView is a real-time recording and visualization tool that allows to analyze runtime behavior of an application. Currently IDF-based application is able to generate SystemView compatible traces in form of files to be opened in SystemView application. The tracing process cannot yet be controlled using that tool. ESP32 timer to use as SystemView timestamp source (CONFIG_SYSVIEW_TS_SOURCE) selects the source of timestamps for SystemView events. In single core mode timestamps are generated using ESP32 internal cycle counter running at maximum 240 Mhz (~4 ns granularity). In dual-core mode external timer working at 40 Mhz is used, so timestamp granularity is 25 ns. IDF has all the code required to produce SystemView compatible traces, so user can just configure necessary project options (see above), build, download the image to target and use OpenOCD to collect data as described in the previous sections. Path to file to save data from PRO CPU. This argument should have the following format: file://path/to/file. Path to file to save data from APP CPU. This argument should have the following format: file://path/to/file. Data polling period (in ms) for available trace data. If greater then 0 then command runs in non-blocking mode. By default 1 ms. Idle timeout (in sec). Tracing is stopped if there is no data for specified period of time. By default -1 (disable this stop trigger). If poll_period is 0 OpenOCD telnet command line will not be available until tracing is stopped. You must stop it manually by resetting the board or pressing Ctrl+C in OpenOCD window (not one with the telnet session). Another option is to set trace_size and wait until this size of data is collected. At this point tracing stops automatically. Collect SystemView tracing data to files “pro-cpu.SVDat” and “pro-cpu.SVDat”. The files will be saved in “openocd-esp32” directory. The tracing data will be retrieved and saved in non-blocking mode. To stop data this process enter esp32 apptrace stop command on OpenOCD telnet prompt, optionally pressing Ctrl+C in OpenOCD window. OpenOCD telnet command line prompt will not be available until tracing is stopped. To stop tracing, press Ctrl+C in OpenOCD window. After trace data are collected user can use special tool to visualize the results and inspect behavior of the program. Unfortunately SystemView does not support tracing from multiple cores. So when tracing from ESP32 working in dual-core mode two files are generated: one for PRO CPU and another one for APP CPU. User can load every file into separate instance of the tool. It is uneasy and awkward to analyze data for every core in separate instance of the tool. Fortunately there is Eclipse plugin called Impulse which can load several trace files and makes it possible to inspect events from both cores in one view. Also this plugin has no limitation of 1,000,000 events as compared to free version of SystemView. Good instruction on how to install, configure and visualize data in Impulse from one core can be found here. IDF uses its own mapping for SystemView FreeRTOS events IDs, so user needs to replace original file with mapping $SYSVIEW_INSTALL_DIR/Description/SYSVIEW_FreeRTOS.txt with $IDF_PATH/docs/api-guides/SYSVIEW_FreeRTOS.txt. Also contents of that IDF specific file should be used when configuring SystemView serializer using above link. Open ‘Signal Ports’ view. Go to Windows->Show View->Other menu. Find ‘Signal Ports’ view in Impulse folder and double-click on it. In open dialog Press ‘Add’ button and select ‘New Pipe/File’. In open dialog select ‘SystemView Serializer’ as Serializer and set path to PRO CPU trace file. Press OK.
Repeat steps 3-4 for APP CPU trace file. Double-click on created port. View for this port should open. Click Start/Stop Streaming button. Data should be loaded. Use ‘Zoom Out’, ‘Zoom In’ and ‘Zoom Fit’ button to inspect data. For settings measurement cursors and other features please see Impulse documentation). If you have problems with visualization (no data are shown or strange behavior of zoom action is observed) you can try to delete current signal hierarchy and double click on the necessary file or port. Eclipse will ask you to create new signal hierarchy.